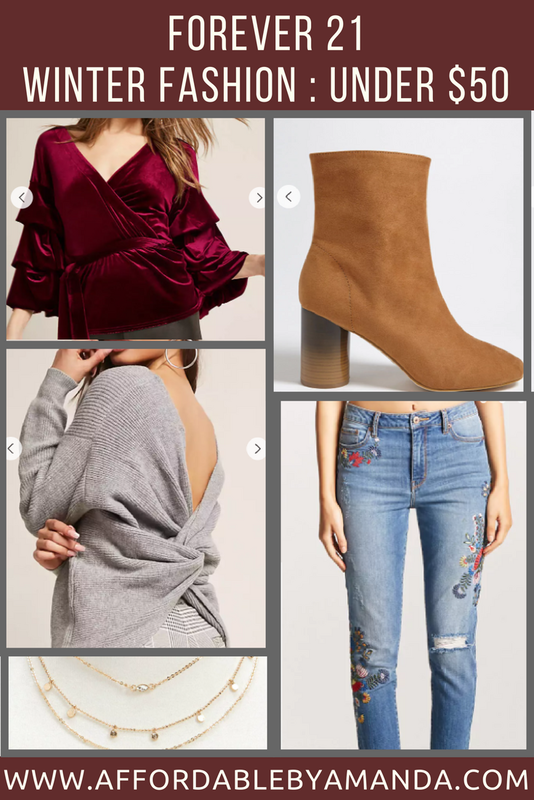 No winter wardrobe is complete without some inexpensive finds from Forever 21! I walked into my local Forever 21 over the weekend and picked up a few warm pieces for my upcoming New York trip next week. A good KNIT SWEATER is always important to pack, and I love the twisted back on this one. I am so excited to finally experience real, authentic WINTER weather (like 40s and 50s!!) because right now it's feeling a lot like summer and I'm over it! I'm ready to put on my jeans, booties, and sweaters for some cozy nights ahead. Let's talk about these winter essentials for a minute: these super cute faux suede ANKLE BOOTIES are sitting right in my suitcase (and are on budget for under $40!). No matter how I plan on styling them while in New York, I know they will look the part as I'm walking through the city. Of course, no shopping trip is complete without a bit of soft VELVET. I'm all about this texture right now! I have velvet dresses and now I'm exploring tops and skirts. This burgundy velvet top (under $40!) looks incredible -- it's perfect for pairing with a black skirt and tall over-the-knee boots for a special Christmas look.